The Enterprise Servers page in Enterprise Server 9 is used for setting up instances of Enterprise Servers that need to act as an application server, file transfer server or background processor for processing Server Jobs. Figure: The Enterprise Servers page. Step 2. In the Enterprise Server Jobs section, click Enterprise Servers. 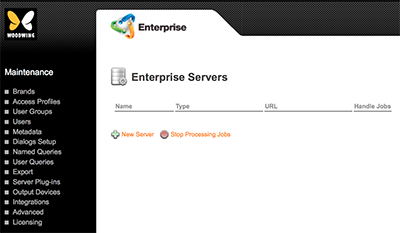 The Enterprise Servers page appears.